I start this post in the middle of the joy that I found. The God's of sneaker Mount Olympus spoke to me. They came to me in my dreams and lead me to the place I been before, but couldn't find my way again. They pulled my fingers cross my phone, leading me to the right place, the right time. Confused as to why I was pulled outta my sleep, I kept scrolling. Hoping to find an answer. Boom, hitting me with a bolt sent from Zeus himself. I found what I was looking for. The bag that will answer my prayers. I have been looking for this bag since I first saw it months ago. I didn't pay it any mind. Thought I would come back later in that week and buy one. Funny how the mind has a mind of its own. I forgot all about the damn bag. On top of it, forgot about the freaking name. Seeing that this is one of the simplest names, I should be ashamed. But thanks to Wex for posting his bag again with the tag. This is the ultimate for anybody like myself that will be traveling. I need something that will hold my babies sneakers safe. So this is perfect. To say I'm in love would be to say that tacos are just meat wrapped in something made from flour with green stuff that can be found in some garden. Love as just the word is the understatement. This is white sneakers never getting a touch of dirt on them. This is merica' fixation with the colliding of two individuals, as one tries to stop the other from scoring. This is Michael Jordan and gambling till 5 am. This is something that I need. I really need two but I need to control myself. This is the duffle from Private Label NYC. "PRIVATE LABEL dares to do what others won't. We are a lifestyle brand that is fixated on pushing boundaries & setting new limits. 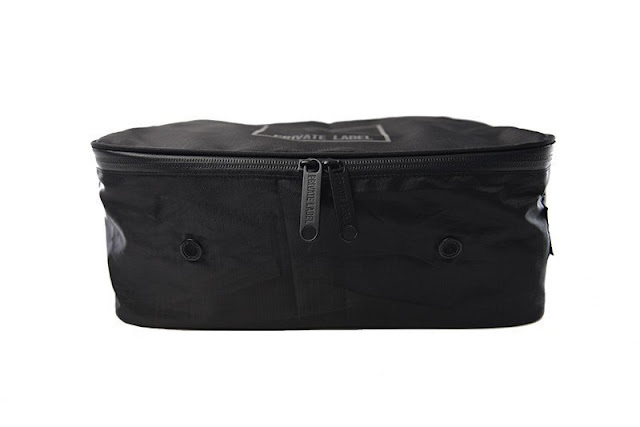 Each duffle comes with three dividing/removable walls for the organization. So you can mix in the clothes and the sneakers. 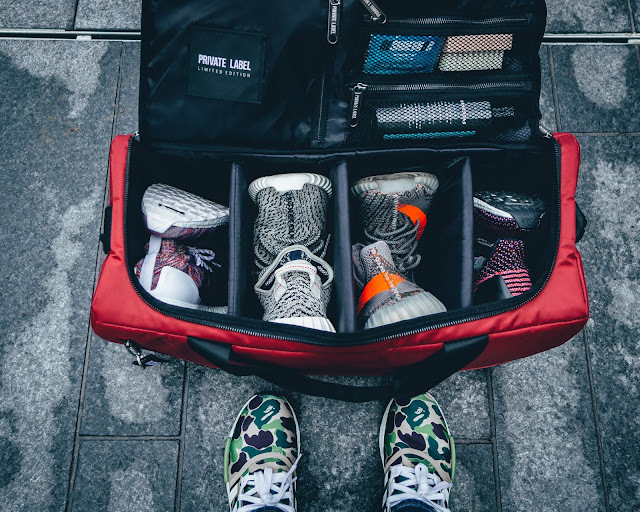 They also have two sneakers bags that comes with each duffle. They hold up to size 14, so my size 10's are good.I also just been looking at the overall size of the bag. I can probably duck my camera in too. Or maybe use one of the two sneakers bags that come with the duffle. The options are really endless. Endless to the point of making a spaceship. That's just impossible. You can get the black bomber (Which is the one I really want) that comes with the "Remove before flight tag" So you can tell people you have been to space. 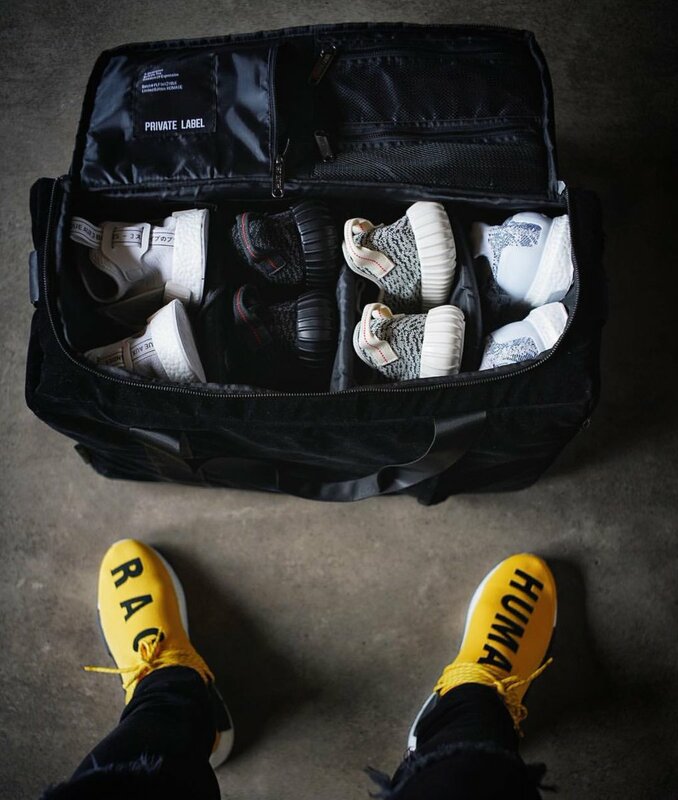 Been reading reviews and everybody seem to love the hold of the bags. The toughness of it. Plus the overall look is amazing. 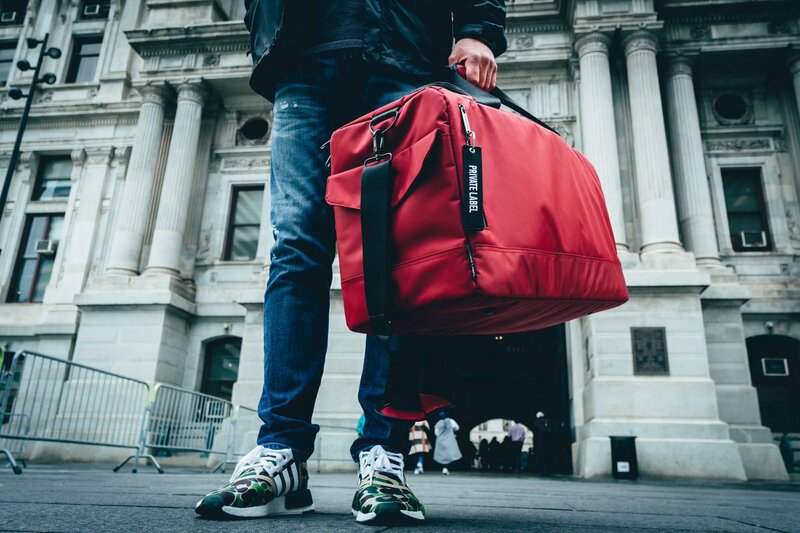 The high-class duffle bag. 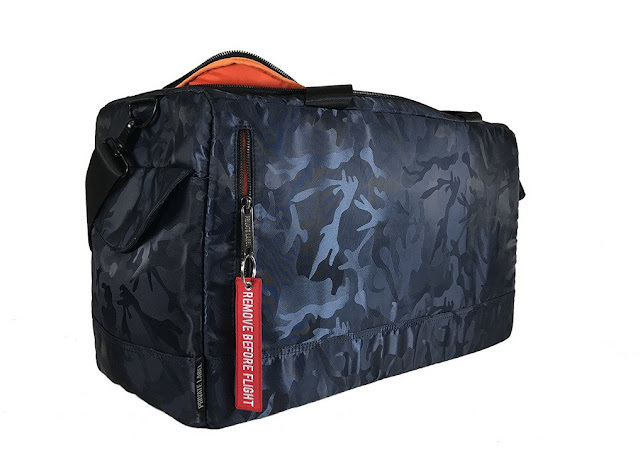 Minimalist style that gives you a modern feel and comfortability of the gym bag at the airport without looking like the man, that has a gym bag at the airport. Now to the problem about the bags. Not so much the problem with the bags but the problem for me. Which is funny cause I didn't notice this at first. Till I was about to buy it. Had it in the cart and everything. The duffles don't ship out until May 15th. My trip is on the 19th of May. Damn. The sneaker Gods show you the world, only to have it outta the reach of your hands. Why you gotta be so mean? Maybe the sneaker Gods love me after all. The trip has been pushed back until the 24th of May. So that should give the bag enough time to get here, right? I'm putting my faith into the travel of light that is the carrying of mail. Looking at you USPS. Don't let me down. I was going to go with the one I first fell in love with. That being the black bomber. Seem too much in my lane. I always seem to go for the black when it comes to anything. It's safe. Like they always say in Vegas 'Always bet on black". Easy to match, etc. I wanted to be a little more open to new things this time around. I mean I do have a red laptop and all. I'm changing. SO I went ahead and got this one. This navy camo bomber. Which matches my housecoat. I'll never be using both at the same time. Hopefully. I can see myself forgetting about when this ships and having it pop up in the mail. Early X-mas.